This week I have been making calm down bottles for Buddy. Initially I intended to make him just one, but it was so beautiful I couldn’t resist making an entire rainbow of them! The poor Train Driver has had to drink six bottles of apple juice in three days for this to happen, so I hope you all love them as much as I do! I added the food colouring to hot water in the bottles until I achieved a colour I was happy with, then squeezed in the glitter glue. The hot water helps to break up the glitter glue and spreads it evenly throughout the mixture – there’s nothing soothing about clumps! You don’t need to measure any of these ingredients. If you shake the bottle and it isn’t glittery enough or the glitter settles too quickly, just add some more glitter glue! We have been playing with these bottles for several days so please excuse Buddy’s changing outfits! Buddy enjoyed shaking the bottle and watching the glitter and sequins settle. 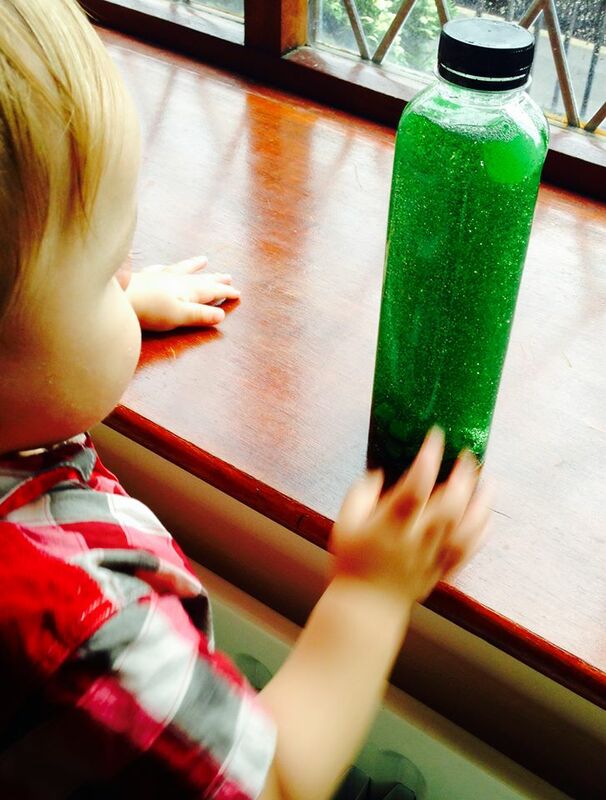 Our bottles were quite heavy, so shaking them is a great workout for little arms! As we didn’t measure our ingredients (I’m just too lazy) some of the bottles settled faster than others. 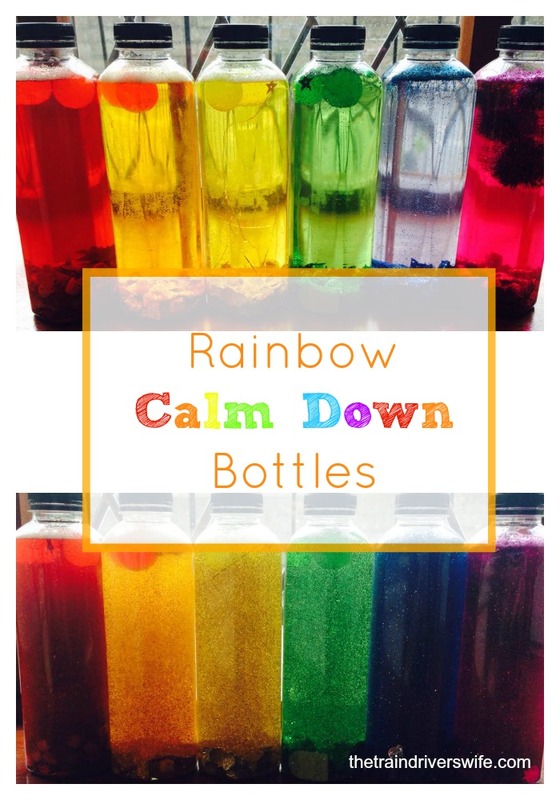 If you make a Rainbow of Calm Down Bottles like I did, you could select a quick or slow settling bottle dependant on how long you want your child to chill out for! Buddy was given the green bottle to tempt him off the coffee table, again. Buddy enjoyed lining the bottles up and shaking them one by one. Here he is surrounded by a rainbow of colours. I have to admit, these are really soothing and relaxing! I’ve even had a few shakes myself when Buddy’s in bed. These calm down bottles are so easy to make, I don’t know why I didn’t make them sooner! As our bottles also have beads, sequins and other objects inside them, they can also be used as mini discovery bottles and they are perfect for practising colour identification too! 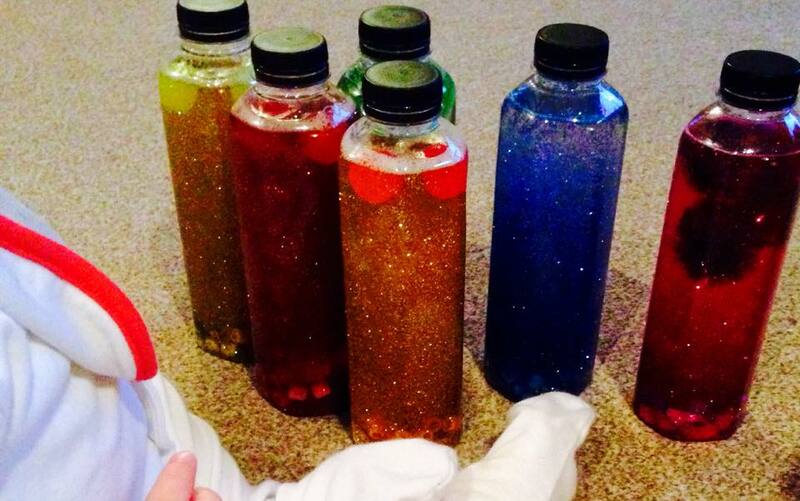 If you like these Sensory Bottles, you may also enjoy our Firework Sensory Bottle. Or if you love Rainbow Sensory Activities, why not check out our Rainbow Spaghetti Play, our Rainbow Oats or our Rainbow Water Beads. Thanks for visiting and don’t forget to leave a comment to let me know what you think of this activity. I love reading them! I love these! When I get a chance to go to the craft store and pick up some sequins I am making some! I’m so happy you like them! They were so easy and quick to make and have provided hours of entertainment so far! I can’t wait to hear how yours turn out! Love this! Can’t wait to share with all my preschool teachers! I’m so pleased you like them! Please come back and let me know how they turn out! I need to make one for someone in my family! 🙂 go for it! they couldn’t be any easier! I am loving all these ideas. I just found this site!! I am going to make these. How many bottles of glitter glue did you use to make 6? Hi Jessica, I’m glad you’ve found some fun ideas! I made these about two years ago but if my memory serves me I think I used two small bottles. I didn’t really measure. I just kept adding and shaking until they looked how I wanted them to.